The Wesenrein End Up On A Trial of Their Own on Grimm: Tribunal. Friday's episode of Grimm, Tribunal, concludes the story of Monroe's kidnapping and trial before the Wesenrein tribunal, and does so with a completely awesome showdown. And there's some good stuff leading up to it too. The whole gang puts their efforts into finding out who was at the wedding that knows someone in the Wesenrein and where they're holding Monroe. And this is not a gang you want to go up against. Spoilers after the break. Picking up from last week, the Wesenrein have taken Monroe out to the clearing in the woods they've set up for his trial, and after what felt like an hour of them chanting the name of their group, which mostly reminded me of the Mandelbaums from Seinfeld when they chant their name. After that, Monroe is read the charges which are marrying outside of his species, and also befriending a Grimm. Side note to the Wesenrein: trying to put someone on trial for befriending a Grimm is a stupid idea because they have a friend who's a Grimm and Grimms kill wessen, which is what you all are. As part of the tribunal, they unshackle Monroe's feet so he can walk up to face them, which was stupid because he takes this opportunity to woge out and make another run for it. He gets decently far, is confronted by a Wesenrein who catches up to him, and manages to kill him. So far, he's managed to get loose twice, and now he's killed one of them, while the most they've done is giving him a few wounds that will heal up easily enough and sprayed some blood on him. And he still has his hands cuffed together. Because he's so friendly and usually gentle it's good to get a reminder that Monroe is pretty deadly when he wants to be. Several members want to kill him on the spot but their grand master insists that killing one of their own be added to the charges to be decided by the tribunal. They also mention they have a witness for the first two charges. Meanwhile, Juliet and Rosalee are trying to figure out which of her wedding guests knew someone on the list of Wesenrein members that Trubel and Bud had come up with. So they decide they'll call Bud to ask for his help. Juliet also makes a very terrible segue into asking Rosalee if someone who wasn't born one could become a hexenbeast. Before putting the focus back on finding Monroe, she tells Juliet that someone who was made into one could be more vicious than someone born as one. Good to know. Bud has also been called in to give Wu a real-life demonstration of a woge. But first, a pep talk from Hank. This is so he'll have an idea of what to expect when he tries to get officer Acker to slip up and admit his ties to the Wesenrein. Speaking of which, when Acker sees Bud, he makes a call asking about why he's there when he was supposed to have been "brought in". Bud gets nervous but eventually shows his beaver face to Wu (which Nick assures him isn't the least bit threatening). After that Wu asks to speak to Acker, and Bud gets a call from Juliette and heads to her house. During his questioning of Acker, Wu gets him to slip up and he woges, into a pig wesen, and Wu knocks him out. He then tells him "I don't know what you are, but you're no Aswan". Damn right he isn't. Good job Sgt. Wu. Nick and Renard were behind the mirror so now they also know what he is. Acker had also heard the rumor that Nick wasn't a Grimm anymore and is scared to learn that's no longer true, but is still willing to die for the cause. No need for that yet, but Nick does rough him up a bit. Which leads to another great Captain Renard moment. Acker, not aware of what the captain is, tries to make a harassment comlaint, and when Renard tells him to just come clean he says to either get his lawyer or let him walk, at which point the Captain calmly tells him his mistake is that he thinks they're still playing by the rules before throwing him over a table and telling Nick and Hank to lock him up. While this is going on, Bud has helped Rosalee and Juliet find out that one of the guests brought a plus one who might be the leak. After helping them Bud heads out to check another possible lead, but is kidnapped (and carjacked) and taken to the tribunal as a very reluctant witness to Monroe's marriage and his friendship with a Grimm. Rosalee and Juliet visit the plus one at work and find out she has a brother who works for the Portland PD, and is in fact none other than officer Acker. They call Nick to let him know and he decides to bring her in because Acker might be willing to die for the cause but is he willing to sacrifice his sister? Turns out, no. After Renard reminds Acker that Nick is a Grimm and what they do is kill wessen, he breaks and tells them where to find Monroe. And the gang stroll out of the precinct ready to rescue their friend. After Bud stalls by being a nervous wreck (which the Wesenrein think is a tactic because they've never spent 2 minutes with him), Monroe is allowed to speak in his defense and tells them off. Here's a clip where he makes it clear that nothing they do will take away his love of Rosalee. Bud actually shows some courage himself and sticks up for Monroe, and speaks up enough to warrant the grand master ordering his throat slit. But the Grimm and his friends show up just in the nick of time (yes, that pun is fully intended). And then the incredibly entertaining showdown begins. Luckily there's a clip because words cannot do it justice. And there you have it. I don't think anyone watching was really worried Monroe wouldn't make it out or the gang wouldn't get there in time, but who cares? That was a great 5 minutes of Grimm. Everyone gets a kill, and most of the episodes highlights are from this part. There's Sgt. Wu shooting a blutbad after he woges and tries to attack, thinking he can take Wu by surprise (nope, wrong). There's the wesen that woges in front of Hank and tries to run away only to get caught by Renard who shows him his true nature before grabbing him by the throat and doing something that gets Hank to say "damn". We finally get to see Juliette put her new hexenbeast powers to use by ripping off the back of a blutbad's head (edit: it has been pointed out on a couple comments that she made his head explode rather than just rip the back of his skull off) and then calmly pick up her gun and walk back to the group. And we get Monroe and Rosalee killing the grand master as a couple. All good stuff. After the rescue, Renard does the other thing he does best (aside from revealing his secret wesen nature and being awesome) which is to provide a cover story for what really happened. He tells the press that they uncovered a secret cult and detained or killed all its members, and that they were secretly run by officer Acker who has also been arrested. Making sure they go on their honeymoon this time, Nick and Hank provide a police motorcade, and joke about going along with Monroe and Rosalee on their honeymoon to make sure they're safe. Sgt. Wu is in the trailer reading up on wesen while eating greasy fast food! Seriously, what the hell Wu?! Did joining the team dumb you down? These are old books passed down over several generations and you're turning the pages with fingers covered in french fry grease. I thought he was going to spill soda on the hexenbeast page. But mostly that was a way to lead to the other aftermath moment. Juliet shows up at Renard's place, having called ahead telling him there was something she needed to talk to him about. But rather than explain, she decides to just show him. And this time, Renard gets to be the one taken by surprise. Again, the showdown was really fun to watch. Officer Acker is pretty stupid. He's a pig wesen, known as the traditional victim of the blutbad, which is what most of the Wesenrein's leadership seems to be. So by wanting to preserve "the natural order of things" he's basically preserving a world where it's normal for them to kill him. 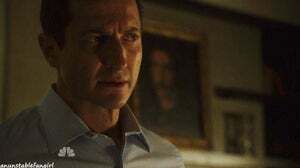 Renard had some great moments in this episode, both with his dealings with Acker, his Wesenrein kill, and his cover story putting all the blame on Acker. Vicious killer Rosalee is still foxy. I really hope the Grimm blood cure won't work on Juliette because she is a lot more interesting as a hexenbeast. In the preview for next week, they show her worried about Nick finding out because he hates hexenbeast which is hopefully a mislead because if not, that's stupid. He really only hates Adalind for all she's done to him and his friends, but he's friends with Captain Renard, and is grateful to Sean's mom for helping restore his powers, and he loves Juliette so he's not going to just kill her for turning into a hexenbeast as a result of the process that restored his powers. What did the rest of you think of the episode? Update: thank you Charlie Jane for mainpaging this!